Try Basil and Olive Oil Ice Cubes. You’ll never run out. Step 1. Use an ice cube tray that you don’t plan to reuse for regular ice cubes ever again. Step 2. Pick a large handful of basil leaves, wash and pat dry. Spread each leaf on paper towel and allow them to air dry thoroughly. Step 3. Chop the basil into very fine pieces. For all you fresh herb-lovers, here is a must have herb chopper . Step 4. 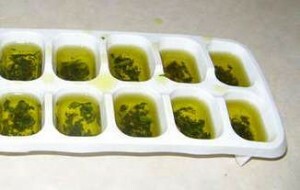 In a bowl combine the chopped basil with enough extra virgin olive oil to fill your ice tray. Step 5. Spoon the mixture into the ice cube tray. Just eyeball it to be sure you have about the same amount of basil in each cube. You can add a little more oil if needed. Step 6. Freeze for at least 2 days. When they are frozen, you can pop the cubes out and put them in a ziplock freezer bag. Now you’re ready to make another batch. You can use these for any dishes you prepare with oil and basil. Pasta dishes, egg dishes, beef, fish, or chicken or add it to baked vegetables. Previous post: Growing potatoes in old tires – a bad idea.